​The Belgian Griffon is a small companion breed that was originally developed from ratters working in the stables of Belgian carriage men. The Fédération Cynologique Internationale (FCI) recognize them as one of three different breeds of griffon from Belgium, the other two being Brussels Griffon and Petit Brabançon. The American Kennel Club and Kennel Club recognize all varieties as a single breed. “Griffon” comes from a French word meaning wiry dog, which is a common name with their hounds and gundogs. The Belgian griffons have no relation to these dogs, but it seems they gained the name due to their own wiry coats. Although the FCI does not classify them as such, the Belgian griffons are likely part of the pinscher/schnauzer family of dogs. This family includes breeds such as the Affenpinscher, Schnauzers, and German and Austrian Pinschers. 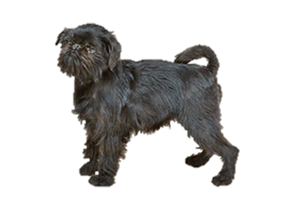 The history of the little Belgian Griffon coincides with that of the Brussels Griffon. Black puppies did not occur in Brussels litters until after crosses with other breeds in the late 1800s. Today the Brussels Griffon enjoys a quiet life of a companion. While not a popular breed, their numbers remain stable and there are enough fanciers that its future appears secure. Is the Belgian Griffon Right for You?